Represents a control that contains multiple items that share the same space on the screen. The TabControl type exposes the following members. TabControl Initializes a new instance of the TabControl class. SelectedContent Gets the content of the currently selected TabItem. SelectedIndex Gets or sets the index of the currently selected TabItem. SelectedItem Gets or sets the currently selected TabItem. TabStripPlacement Gets or sets how TabItem headers align relative to the TabItem content. OnSelectionChanged Raises the SelectionChanged event. SelectionChanged Occurs when the selected TabItem changes. SelectedContentProperty Identifies the SelectedContent dependency property. SelectedIndexProperty Identifies the SelectedIndex dependency property. SelectedItemProperty Identifies the SelectedItem dependency property. TabStripPlacementProperty Identifies the TabStripPlacement dependency property. The TabControl is useful for minimizing screen space usage while allowing an application to expose a large amount of data. 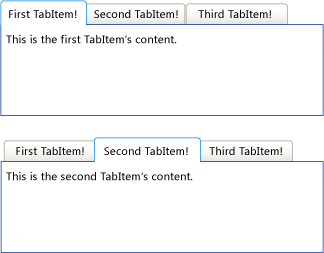 A TabControl consists of multiple TabItem objects that share the same screen space. Only one TabItem in a TabControl is visible at a time. When the user selects a TabItem, the content of that TabItem become visible and the content of other TabItem objects are hidden. You can specify which tab item displays with the SelectedIndex or the SelectedItem property. The TabControl control is available as part of the libraries in the Silverlight Software Development Kit (SDK). For more information, see the Silverlight Tools. To apply the same property settings to multiple TabControl controls, use the Style property. To change the visual structure and visual behavior of a TabControl, copy and modify its default style and template. For more information, see Control Customization. Dependency properties for this control might be set by the default style of the control. If a dependency property for a TabControl is set by its default style, the property might change from its default value when the TabControl appears in the application. For more information, see Dependency Property Value Precedence. You can get the default style and template for ScrollViewer from TabControl Styles and Templates. Setting a visual property will only have an effect if that property is both present in TabControl control's default template and is set by using a TemplateBinding. You can find a list of visual properties in the "Changing the Visual Structure of a Control" section of Customizing the Appearance of an Existing Control by Using a ControlTemplate. The following XAML and code creates two TabControl objects, populates them with information, and handles the SelectionChanged event. ti.Content = "This is the first TabItem's content." ti.Content = "This is the second TabItem's content." ti.Content = "This is the third TabItem's content." ti.Content = "This is the first TabItem of the second TabControl." ti.Content = "This is the second TabItem of the second TabControl." ti.Content = "This is the third TabItem of the second TabControl." 'TabControl, rather than the top. 'Set the selected TabItem of tab1 to match tab2. //TabControl, rather than the top. //Set the selected TabItem of tab1 to match tab2. topic "Prefixes and Mappings for Silverlight Libraries". The previous example produces output that is similar to the following illustration. Two TabControl controls are shown, one with the first tab selected, and one with the second tab selected.